In my research I analyze the achievable ranging and positioning performance for a radio frequency identification (RFID) system. 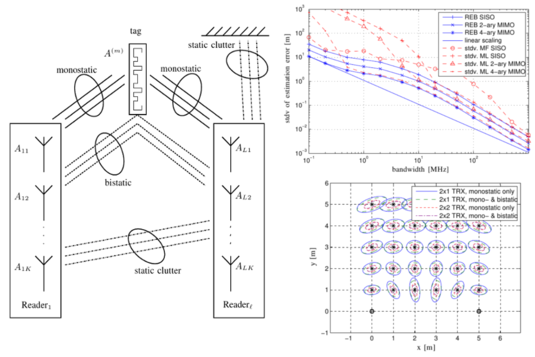 Two design constraints of such a system, (i) the bandwidth of the transmit signal and (ii) the use of multiple antennas at the readers are analyzed in my paper 'MIMO gain and bandwidth scaling for RFID positioning in Dense Multipath Channels'. The ranging performance is developed for correlated and uncorrelated constituent channels by utilizing a geometry-based stochastic channel model for the downlink and the uplink. The ranging error bound is utilized to compute the precision gain for a ranging scenario with multiple collocated transmit and receive antennas. The position error bound is then split into a monostatic and bistatic component to analyze the positioning performance in a multiple input, multiple output (MIMO) RFID system. Simulation results indicate that the ranging variance is approximately halved when utilizing uncorrelated constituent channels in a monostatic setup. It is shown that both the bandwidth and the number of antennas decrease the error variance roughly quadratically. The left half of the picture shows the system model with two RFID readers with multiple colocated antennas, an RFID tag and the different possible links between these entities. Solid lines indicate a monostatic link connecting antennas from one reader via the tag with itself. The individual up- and downlink channels can be correlated or uncorrelated). Dashed lines represent bistatic links between antennas from one reader via the tag with a different reader. The plot in the upper right hand corner depicts the ranging error bound (REB) for different reader arrays. The plot in the lower right hand side shows the position error bound as 2-fold standard deviation ellipses for a bandwidth of 50 MHz and different MIMO constellations.